For other places with the same name, see Swansea (disambiguation). Swansea (/ˈswɒnzi/; Welsh: Abertawe [abɛrˈtawɛ]), is a coastal city and county, officially known as the City and County of Swansea (Welsh: Dinas a Sir Abertawe) in Wales. Swansea lies within the historic county boundaries of Glamorgan and the ancient Welsh commote of Gŵyr on the southwest coast. 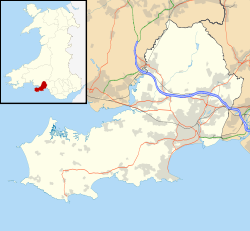 The county area includes Swansea Bay (Welsh: Bae Abertawe) and the Gower Peninsula. Swansea is the second largest city in Wales and the twenty-fifth largest city in the United Kingdom. According to its local council, the City and County of Swansea had a population of 241,300 in 2014. The last official census stated that the city, metropolitan and urban areas combined concluded to be a total of 462,000 in 2011; the second most populous local authority area in Wales after Cardiff. Archaeological finds in the Swansea area come mostly from the Gower Peninsula, and include items from the Stone Age, Bronze Age, and Iron Age. The Romans occupied the area. [citation needed] The two largest rivers in the region are the Tawe which passes through the city centre and the Loughor which marks the northern border with Carmarthenshire. The Welsh name, Abertawe, translates to Mouth of the Tawe. It first appears c.1150 as Aper Tyui. Swansea is thought to have developed as a Viking trading post. Its English name may derive from Sveinn's island – Old Norse: Sveinsey – the reference to an island may refer either to a bank at the mouth of the River Tawe or to an area of raised ground in marshes. An alternative explanation derives the place name from the Norse personal name Sweyn and ey, which can mean "inlet". This explanation supports the tradition that the city was founded by King Sweyn Forkbeard (reigned in Denmark from 986 to 1014). The name is pronounced Swans-y /ˈswɒnzi/), not Swan-sea. The earliest known form of the modern name, Sweynesse, appears in the first charter, granted sometime between 1158 and 1184 by William de Newburgh, 3rd Earl of Warwick. The charter gave Swansea the status of a borough, granting the townsmen (called burgesses) certain rights to develop the area. In 1215 King John granted a second charter, in which the name appears as Sweyneshe. A town seal which is believed to date from this period names the town as Sweyse. Following the Norman conquest, a marcher lordship was established[by whom?] under the title of Gower. It included land around Swansea Bay as far as the River Tawe, the manor of Kilvey beyond the Tawe, and the peninsula itself. Swansea was designated chief town of the lordship and received a borough charter at some point between 1158 and 1184 (and a more elaborate one in 1304). The first copper smelter at Swansea was established in 1717, followed by many more. Once smelting was established, the smelters began receiving high-grade ore and ore concentrates from around the world. More coal mines opened to meet demand from northeast Gower to Clyne and Llangyfelach. In the 1850s Swansea had more than 600 furnaces, and a fleet of 500 oceangoing ships carrying out Welsh coal and bringing back metal ore from around the world. At that time most of the copper matte produced in the United States was sent to Swansea for refining. . The city expanded rapidly in the 18th and 19th centuries, and was termed "Copperopolis". From the late 17th century to 1801, Swansea's population grew by 500%—the first official census (in 1841) indicated that, with 6,099 inhabitants, Swansea had become significantly larger than Glamorgan's county town, Cardiff, and was the second most populous town in Wales behind Merthyr Tydfil (which had a population of 7,705). However, the census understated Swansea's true size, as much of the built-up area lay outside the contemporary boundaries of the borough; the total population was actually 10,117. Swansea's population was later overtaken by Merthyr in 1821 and by Cardiff in 1881, although in the latter year Swansea once again surpassed Merthyr. Much of Swansea's growth was due to migration from within and beyond Wales—in 1881 more than a third of the borough's population had been born outside Swansea and Glamorgan, and just under a quarter outside Wales. Copper smelting at Swansea declined in the late 1800s for a number of reasons. Copper mining in Cornwall declined. The price of copper dropped from £112 in 1860 to £35 in the 1890s. In the early 1900s, mining shifted to lower-grade copper deposits in North and South America, and the lower-grade ore could not support transportation to Swansea. The Swansea and Mumbles Railway was built in 1804 to move limestone from the quarries of Mumbles and coal from the Clyne valley to Swansea and to the markets beyond. It carried the world's first fare-paying rail passengers on the day the British Parliament abolished the transportation of slaves from Africa. It later moved from horse power to steam locomotion, and finally converting to electric trams, before closing in January 1960, in favour of motor buses. Through the 20th century, heavy industries in the town declined, leaving the Lower Swansea Valley filled with derelict works and mounds of waste products from them. The Lower Swansea Valley Scheme (which still continues) reclaimed much of the land. The present Enterprise Zone was the result and, of the many original docks, only those outside the city continue to work as docks; North Dock is now Parc Tawe and South Dock became the Marina. In the Second World War its industrial importance made Swansea the target of German bombing, and much of the town centre was destroyed during the Swansea Blitz on the 19, 20 and 21 February 1941 (the 'Three Nights Blitz'). In 1969 Swansea was granted city status to mark Prince Charles's investiture as the Prince of Wales. The Prince made the announcement on 3 July 1969 during a tour of Wales. Swansea obtained the further right to have a Lord Mayor in 1982. Within the city centre are the ruins of the castle, the Marina, the Glynn Vivian Art Gallery, Swansea Museum, the Dylan Thomas Centre, the Environment Centre, and the Market, which is the largest covered market in Wales. It backs onto the Quadrant Shopping Centre, which opened in 1978, and the adjoining St David's Centre opened in 1982. Other notable modern buildings include the BT Tower (formerly the GPO tower) built around 1970, Alexandra House opened in 1976, County Hall opened in July 1982. Swansea Leisure Centre opened in 1977; it has undergone extensive refurbishment which retained elements of the original structure and re-opened in March 2008. The "City and County of Swansea" local authority area is bordered by unitary authorities of Carmarthenshire to the north, and Neath Port Talbot to the east. The Urban Subdivision of Swansea covers all urbanised areas within the city boundary, with a population of 179,485, it is considerably smaller than the unitary authority. In 1887, Swansea was a township at the mouth of the river Tawe, covering 4,562 acres (1,846 ha) in the county of Glamorgan. There were three major extensions to the boundaries of the borough, first in 1835, when Morriston, St Thomas, Landore, St John-juxta-Swansea, and part of Llansamlet parish were added, and again in 1889 when areas around Cwmbwrla and Trewyddfa were included, and in 1918 when the borough was enlarged to include the whole of the ancient parish of Swansea, the southern part of Llangyfelach parish, all of Llansamlet parish, Oystermouth Urban District and Brynau parish. In 1889, Swansea attained county borough status, and it was granted city status in 1969, which was inherited by the Swansea district when it was formed by the merger of the borough and Gower Rural District in 1974. In 1996, Swansea became one of 22 unitary authorities with the addition of part of the former Lliw Valley Borough. The new authority received the name 'City and County of Swansea' (Welsh: Dinas a Sir Abertawe). Swansea was once a staunch stronghold of the Labour Party which, until 2004, had overall control of the council for 24 years. The Liberal Democrats were the largest group in the administration that took control of Swansea Council in the 2004 local elections until the 2012 council elections saw the council return to Labour control. For 2009/2010, the Lord Mayor of Swansea was Councillor Alan Lloyd, and in 2010/2011 Richard Lewis was the Lord Mayor. The Lord Mayor changes in May each year. The city is also part of the South Wales West regional constituency and is served by Suzy Davies AM (Conservative), Bethan Jenkins AM (Plaid Cymru), Caroline Jones AM (UKIP) and Dai Lloyd AM (Plaid Cymru). Swansea can be roughly divided into four physical areas. The geology is complex, providing diverse scenery. The Gower Peninsula to the west was the first area in the United Kingdom to be designated as an Area of Outstanding Natural Beauty (AONB). Apart from the southeast corner, the whole of the Gower Peninsula is within the AONB. Swansea has numerous urban and country parklands. The region has featured regularly in the Wales in Bloom awards. To the north are the Lliw uplands which are mainly open moorland, reaching the foothills of the Black Mountain range. To the east is the coastal strip around Swansea Bay. Cutting though the middle from the southeast to the northwest is the urban and suburban zone stretching from the Swansea city centre to the towns of Gorseinon and Pontarddulais. The most populated areas of Swansea are Morriston, Sketty and the city centre. The chief urbanised area radiates from the city centre towards the north, south and west; along the coast of Swansea Bay to Mumbles; up the Swansea Valley past Landore and Morriston to Clydach; over Townhill and Mayhill to Cwmbwrla, Penlan, Treboeth and Fforestfach; through Uplands, Sketty, Killay to Dunvant; and east of the river from St. Thomas to Bonymaen, Llansamlet and Birchgrove. A second urbanised area is focused on a triangle defined by Gowerton, Gorseinon and Loughor along with the satellite communities of Penllergaer and Pontarddulais. About three-quarters of Swansea is on the coast—the Loughor Estuary, Swansea Bay and the Bristol Channel. The geology of the Gower Peninsula ranges from Carboniferous Limestone cliffs along its southern edge from Mumbles to Worm's Head and the salt-marshes and dune systems of the Loughor estuary to the north. The eastern, southern and western coasts of the peninsula are lined with numerous sandy beaches both wide and small, separated by steep cliffs. The South Wales Coalfield reaches the coast in the Swansea area. This had a great bearing on the development of the city of Swansea and other nearby towns such as Morriston. The inland area is covered by large swathes of grassland common overlooked by sandstone heath ridges including the prominent Cefn Bryn. The traditional agricultural landscape consists in a patchwork of fields characterised by walls, stone-faced banks and hedgerows. Valleys cut through the peninsula and contain rich deciduous woodland. Much of Swansea is hilly with the main area of upland being located in the council ward of Mawr. Areas up to 185 metres (607 ft) range across the central section: Kilvey Hill, Townhill and Llwynmawr separate the centre of Swansea from its northern suburbs. Cefn Bryn, a ridge of high land, is the backbone of the Gower Peninsula. Rhossili Down, Hardings Down and Llanmadoc Hill are up to 193 metres (633 ft) high. The highest point is located Penlle'r Castell at 374 metres (1,227 ft) on the northern border with Carmarthenshire. Typical of the west of Britain, Swansea has a temperate oceanic climate. As part of a coastal region, it experiences a milder climate than the mountains and valleys inland. This same location, though, leaves Swansea exposed to rain-bearing winds from the Atlantic. In midsummer, Swansea's temperatures can reach into the high twenties Celsius. From 1804 until the 1920s, Swansea experienced continuous population growth. The 1930s and 1940s was a period of slight decline. In the 1950s and 1960s the population grew and then fell in the 1970s. The population grew again in the 1980s only to fall again in the 1990s. In the 21st century, Swansea is experiencing a small amount of population growth; the local authority area had an estimated population of 228,100 in 2007. Around 82% of the population were born in Wales and 13% born in England; 13.4% were Welsh speakers. The wider urban area, including most of Swansea Bay, has a total population of 300,352, making it the third largest urban area in Wales and the 27th largest urban area in the United Kingdom. Over 218,000 individuals are white; 1,106 are of mixed race; 2,215 are Asian – mainly Bangladeshi (1,015); 300 are black; and 1,195 belong to other ethnic groups. The Office for National Statistics 2010 mid-year population estimate for the City & County of Swansea is 232,500. The Royal Institution of South Wales was founded in 1835 as the Swansea Literary and Philosophical Society. The Grand Theatre in the centre of the city is a Victorian theatre which celebrated its centenary in 1997 and which has a capacity of a little over a thousand people. It was opened by the celebrated opera singer Adelina Patti and was refurbished from 1983 to 1987. The annual programme ranges from pantomime and drama to opera and ballet. Fluellen Theatre Company is a professional theatre company based in Swansea who perform at the Grand Theatre and the Dylan Thomas Centre. The Taliesin building on the university campus has a theatre, opened in 1984. Other theatres include the Dylan Thomas Theatre (formerly the Little Theatre) near the marina, and one in Penyrheol Leisure Centre near Gorseinon. In the summer, outdoor Shakespeare performances are a regular feature at Oystermouth Castle, and Singleton Park is the venue for a number of parties and concerts, from dance music to outdoor Proms. A folk festival is held on Gower. Standing near Victoria Park on the coast road is the Patti Pavilion; this was the Winter Garden from Adelina Patti's Craig-y-Nos estate in the upper Swansea valley, which she donated to the town in 1918. It is used as a venue for music shows and fairs. The Brangwyn Hall is a multi-use venue with events such as the graduation ceremonies for Swansea University. Every autumn, Swansea hosts a Festival of Music and the Arts, when international orchestras and soloists visit the Brangwyn Hall. The Brangwyn Hall is praised for its acoustics for recitals, orchestral pieces and chamber music alike. Swansea is home to the Palace Theatre. Located at 156 High Street, it is recognisable for its distinctive wedge shape. Originally built in 1888 as a traditional music hall, the building's original name was the 'Pavilion'. During its lifetime, the building has been used as a bingo hall as well as a nightclub. In 2018 Singleton Park, Swansea was the home-city for BBC Music's 'Biggest Weekend' featuring Ed Sheeran, Taylor Swift, Sam Smith, Florence + The Machine and others. Priority was given to Swansea residents in purchasing tickets for this one-off 'day festival' (over 2 days); tickets were priced at £18 a day and all 60,000 tickets (30,000 for each day) sold out almost instantly. Swansea hosted the National Eisteddfod in 1863, 1891, 1907, 1926, 1964, 1982 and 2006. The 2006 event occupied the site of the former Felindre tinplate works to the north of the city and featured a strikingly pink main tent. In 2009 Swansea Council launched Wales's only week long St David's Week festival in venues throughout the city. The Beginning and Do Not Go Gentle are Festivals in the Uplands area of the city where Dylan Thomas was born and lived for 23 years. There are many Welsh language chapels and churches in the area. Welsh-medium education is a popular and growing choice for both English and Welsh speaking families. Just over 1,600 secondary pupils were educated through the medium of Welsh in 2017. Nearly double this figure, 3,063 pupils are currently educated through the medium of Welsh in the primary sector. The 2014 Swansea Pre-School survey showed that 35% of parents across the City and County of Swansea would select a Welsh education for their children if there was a local Welsh school available to them. 45% of the rural council ward Mawr are able to speak Welsh, as can 38% of the ward of Pontarddulais. Clydach, Kingsbridge and Upper Loughor all have levels of more than 20%. By contrast, the urban St. Thomas has one of the lowest figures in Wales, at 6.4%, a figure only barely lower than Penderry and Townhill wards. salt marsh lamb raised in the salt marshes of the Loughor estuary. The city has three Grade One listed buildings: Swansea Castle, the Tabernacle Chapel, Morriston and the Swansea Guildhall. Swansea Castle was an impressive building occupying a strategic position above the River Tawe. The ruins that are visible today date from the late 13th and early 14th centuries. Today, the castle is hemmed in by modern buildings. The Tabernacle Chapel at Morriston was built in 1872 by John Humphreys of Swansea. A unique feature is the use of semi-circular arches. The building has been described as the "Nonconformist Cathedral of Wales" and has been listed as Grade I on the basis that it is "the most ambitious grand chapel in Wales, its interior and fittings remain virtually unaltered". The Guildhall is one of the main office buildings in the centre of the city and was designed by Percy Thomas and opened in 1934. It is faced in white Portland stone and includes a tall clock-tower which makes it a landmark. The building comprises the City Hall, the Brangwyn Hall concert venue and the County Law Courts. It is considered "the most important building in Wales of its period". In addition to these there are a number of Grade II* listed buildings; Ebenezer Baptist Chapel and its Hall in Ebenezer Street; the Glynn Vivian Art Gallery; the Midland Bank building; the Mount Pleasant Baptist Church in Kingsway, along with its Hall and School blocks; the Offices of Associated British Ports in Pier Street; the Royal Institution of South Wales building, now Swansea Museum in Victoria Road; and the Old Guildhall in Somerset Place. The poet Dylan Thomas is perhaps the best-known. He was born in the town and grew up at 5 Cwmdonkin Drive, Uplands, where he lived for 23 years and produced two-thirds of his published work from his tiny bedroom which has been faithfully recreated as it may have been in 1934 and is open for house tours, events, Edwardian dinner parties and overnight stays. There is a memorial to him in the nearby Cwmdonkin Park; his take on Swansea was that it was an "ugly lovely town". In the 1930s Thomas was a member of a group of local artists, writers and musicians known as The Kardomah Gang, as they frequently met in the Kardomah Café which was in Castle Street, Swansea until bombed during the second World War. Throughout the 19th century, the Vivian family did much to develop Swansea into a city. Their wealth and influence came from large copper mining, smelting and trading businesses in Swansea (Vivian & Sons), and is still visible today in their former family residences: Singleton Abbey (now used by Swansea University), Sketty Hall, Clyne Castle and Clyne Gardens. Henry Vivian became the first Lord Swansea in 1893. Swansea's most famous daughter is Hollywood actress Catherine Zeta-Jones who still owns a home in Mumbles. Swansea is also the home town of 2013 ITU Triathlon World Champion Non Stanford. The thriller writer, Mark Ellis was educated in Swansea. People from Swansea are known locally as Swansea Jacks, or just Jacks. The source of this nickname is not clear. Some attribute it to Swansea Jack, the life-saving dog. Swansea City A.F.C. (founded 1912) is the city's main football association team. Originally playing at the Vetch Field, they moved to the Liberty Stadium at the start of the 2005–2006 season, winning promotion to League One in their final year at their old stadium. The team presently play in the English Championship, after spending seven seasons in the Premier League. The Football Association of Wales had decided that for the Euro 2012 qualifying campaign, Wales would play all of their home ties at either the Cardiff City Stadium or the Liberty Stadium. Swansea has three association football clubs that play in the Welsh Football League: Garden Village, South Gower and West End. Swansea is home to Swansea Rugby Football Club (Swansea RFC), a founder member of the Welsh Rugby Union and one of the most important teams in the early history of Welsh rugby union. Playing out of St Helens Rugby and Cricket Ground the club not only produced several of the greatest Welsh rugby superstars, including Billy Bancroft and Billy Trew, they also hosted national touring sides from Australia, South Africa and New Zealand. Known as the 'All Whites', Swansea kept a constant supply of players that filled the Welsh ranks in the early history of the game. In 1935 Swansea became the first club side to beat the All Blacks. In 2003, Swansea RFC merged with Neath RFC to form the Ospreys. Swansea RFC remained at St Helen's in semi-professional form, but the Ospreys moved into the Liberty Stadium in Landore for the start of the 2005–2006 season. Neath-Swansea rugby games used to be hotly contested matches, such that there was some debate about whether a team incorporating both areas was possible. The team came fifth in the Celtic League in their first year of existence and topped that league in their second year. By 2012 they had won the league a record four times. St Helens Rugby and Cricket Ground is the home of Swansea RFC and Glamorgan County Cricket Club have previously played matches there. In this ground, Sir Garfield Sobers hit six sixes in one over; the first time this was achieved in a game of first-class cricket. The final ball landed on the ground past the Cricketers' pub just outside the ground. It is also the home of the tallest floodlight stand in Europe. Swansea's rugby league side plays 13 miles (21 km) from Swansea in the small town of Ystalyfera. They are known as the Swansea Valley Miners but were formed as the Swansea Bulls in 2002. The Swansea Bowls Stadium opened in early 2008. The stadium hosted the World Indoor Singles and Mixed Pairs Championship in April 2008 and the Gravelles Welsh International Open Bowls Championships in 2009. In 2001, 158,457 people in the local authority area (71 per cent) stated their religion to be Christian, 44,286 (20 per cent) no religion, 16,800 (7.5 per cent) did not state a religion and 2,167 were Muslim. There are small communities of other religions, each making up a little under 1 per cent of the total population. Swansea is part of the Anglican Diocese of Swansea and Brecon and the Roman Catholic Diocese of Menevia. The Catholic see is based in Swansea at St. Joseph's Cathedral in the Greenhill area. Swansea, like Wales in general, has seen many Non-conformist religious revivals. In 1904, Evan Roberts, a miner from Loughor (Llwchwr), just outside Swansea, was the leader of what has been called one of the world's greatest Protestant religious revivals. Within a few months about 100,000 people were converted. This revival in particular had a profound effect on Welsh society. Swansea is covered by the Swansea and Gower Methodist Circuit. The Ebenezer Baptist Church dates from November 1875 when the foundation stone was laid for Tabernacle chapel in Skinner Street. The first pastor, the Rev. J. D. Jones, was called in February 1876 and the new building was opened in July that year. The church was served by a number of ministers until 1911 when the Rev. R. J. Willoughby came to the church. The church has an organ by Harrison & Harrison. The Norwegian Church is a Grade II listed building in the docklands area of the city. The church building was originally located at Newport Docks. The building consists of a Seaman's Mission to the west end and a single gothic church to the east end. It was originally built as a place of worship for Norwegian sailors when they visited the UK. It was relocated to Swansea in 1910 at a site directly opposite the Sainsbury's supermarket on the River Tawe. The city is home to 10% of the total Welsh Muslim population; Swansea's Muslim community is raising money to open a new central mosque and community centre in the former St. Andrew's United Reformed Church. This would replace the existing central Mosque on St Helens Road and be in addition to the other three existing mosques (Swansea University Mosque, Hafod Mosque, Imam Khoei Mosque). Swansea is represented in Buddhism with the Dharmavajra Kadampa Buddhist Centre, Pulpung Changchub Dargyeling (Kagyu Tradition) and a branch of the international Dzogchen Community (Nyingma Tradition). Swansea Synagogue and Jehovah's Witness Kingdom Hall are both located in the Uplands area. Swansea City Centre is undergoing a £1 billion transformation scheme. A large area of the city is earmarked for redevelopment. A new city-centre retail precinct is planned involving demolition of the dilapidated St. David's Shopping Centre which has three or four traders, about 13% of the retail space in the centre and the Quadrant Shopping Centre. Including relocation of the Tesco Superstore near to the city's Sainsbury's store in Parc Tawe, the new retail precinct will be almost four times the size of the Quadrant Centre. The city centre is also being brightened up with street art and new walkways, along with the first phase of the David Evans – Castle Street development. New green spaces will be provided in conjunction with the proposed Quadrant Square and Grand Theatre Square. Redevelopment of the Oxford Street car park and Lower Oxford Street arcades are also planned. At the sea front, The Tower, Meridian Quay is now Wales's tallest building at a height of 107 metres (351 ft) with a restaurant on the top (29th) floor. It was under construction adjacent Swansea Marina until 2010. Swansea originally developed as centre for metals and mining, especially the copper industry, from the beginning of the 18th century. The industry reached its apogee in the 1880s, when 60% of the copper ores imported to Britain were smelted in the Lower Swansea valley. However, by the end of the Second World War these heavy industries were in decline, and over the post-war decades Swansea shared in the general trend towards a post-industrial, service sector economy. Swansea is home to the DVLA headquarters in Morriston, which employs around 6,000 people in the city. Other major employers in the city are Admiral Group, HSBC, Virgin Media, Abertawe Bro Morgannwg University Health Board, BT and Amazon.co.uk. Virgin Atlantic also maintains its largest worldwide contact centre in Swansea; including reservations, sales, baggage claims, and customer relations. Swansea University has a campus in Singleton Park overlooking Swansea Bay. Its engineering department is recognised as a centre of excellence with pioneering work on computational techniques for solving engineering design problems. The Department of Physics is renowned for its research achievements at the frontiers of Theoretical Physics, particularly in the areas of Elementary Particle Physics and String Theory. And many other departments such as History, Computer Science and German were awarded an "Excellent" in the last inspection. The university was awarded The Times Higher Education Supplement Award for the UK's "best student experience" in 2005. In 2017, Swansea University Medical School was ranked as the third best medical school in the United Kingdom, behind Oxford and Cambridge universities. Other establishments for further and higher education in the city include University of Wales Trinity Saint David and Gower College Swansea. Trinity Saint David was formed on 18 November 2010 through the merger of University of Wales Lampeter and Trinity University college Carmarthen under Lampeter's royal charter of 1828. On 1 August 2013, Swansea Metropolitan University became part of University of Wales Trinity Saint David (UWTSD). Swansea Metropolitan University is particularly well known for its Architectural Glass department, as well as its Teaching and Transport & Logistics degrees. [citation needed] In 2015 Swansea University opened a new Bay Campus situated in the Jersey Marine area of Swansea. The oldest school in Swansea is Bishop Gore School. The largest comprehensive school in Swansea is Olchfa School. There is one Roman Catholic comprehensive school in the city – Bishop Vaughan Catholic Comprehensive School. The Welsh medium schools are Ysgol Gyfun Gymraeg Gŵyr and Ysgol Gyfun Gymraeg Bryn Tawe. Other schools in Swansea include Birchgrove Comprehensive School, Cefn Hengoed Community School, Dylan Thomas School, Pentrehafod Comprehensive School, Morriston Comprehensive School and Gowerton School. Independent schools in Swansea include Ffynone House School and Oakleigh House School. The local newspaper is the Swansea edition of the South Wales Evening Post. The Swansea Herald of Wales was a free newspaper which was distributed every week to residential addresses until 2011 when the paper ceased to be in print. The Cardiff edition of the free daily paper Metro is distributed throughout the city. The Council also produces a free monthly newspaper called the Swansea Leader. Swansea Life is a monthly lifestyle magazine published and distributed in Swansea. Swansea is served by three local radio stations – the Contemporary Hit Radio-formatted 96.4 The Wave on FM and DAB, its sister station Swansea Sound on 1170MW and DAB and lastly, the Adult Contemporary-orientated 102.1 Swansea Bay Radio on FM and DAB. The city also has a community radio station Radio Tircoed. It is also served by two regional radio stations: Heart South Wales on its Swansea area frequency (106.0FM) and Nation Radio on its Swansea area frequency (107.3FM) and DAB. The patients and staff at Singleton Hospital can listen to the hospital radio station, Radio City 1386AM and Swansea University also runs its own radio station, Xtreme Radio, on 1431 AM. Providing the DAB service, the local multiplex called Swansea SW Wales is broadcast from Kilvey Hill. This transmitter also provides digital terrestrial television in the Swansea area. As well as Kilvey Hill the city is in the catchment areas of the Wenvoe transmitter (in the Vale of Glamorgan) and the Carmel transmitter in Carmarthenshire. Since 1924, the BBC has maintained a studio in the city; Dylan Thomas worked here in the interwar years, when the studio was used for the BBC Regional Programme. Currently it has facilities to broadcast live radio and television and is listed as a BBC regional studio. Independent filmmakers Undercurrents and Studio8 are based in Swansea, and the city plays host to the BeyondTV Film Festival. BeyondTV is annual event organised by Undercurrents to showcase the best of activism filmmakers. Swansea has also hosted the annual Swansea Bay Film Festival, where past-winning directors have included Gareth Evans, Anthony James, Alun D Pughe and Andrew Jones. Swansea has been used as a location for films such as Only Two Can Play, Submarine and Twin Town, the TV series Mine All Mine and in episodes of Doctor Who. Swansea was the first city in Wales to feature in its own version of the board game Monopoly. The Swansea edition of Monopoly features 33 local landmarks, including the Mumbles Pier and the National Waterfront Museum; the game has been produced in both English and Welsh. Swansea was also featured in a television documentary titled Swansea Love Story as part of the Rule Britannia series on VBS.tv. The film is of a rather graphic nature and features heroin users as well as community members affected by the narcotic while trying to provide some explanation for the increase in use. Swansea was featured in several Yes Minister series as an undesirable civil service posting, in particular the vehicle licensing centre. Swansea is also the hometown of Edward Kenway, the main protagonist of Assassin's Creed IV: Black Flag. This is because Matt Ryan, the voice actor of Edward, is from Swansea. Swansea is policed by the South Wales Police. The regional headquarters for the Swansea area is Swansea Central Police Station. Ambulance services are provided by the Welsh Ambulance Service, and fire services by the Mid and West Wales Fire and Rescue Service. Swansea Airport is one of the country's three Wales Air Ambulance bases, the others being Welshpool and Caernarfon. Local public healthcare services are operated by Abertawe Bro Morgannwg University Health Board, who operate two hospitals in Swansea, Singleton Hospital and Morriston Hospital; the latter provides Accident and Emergency services. Singleton Hospital has one of Wales's three radiotherapy departments. Waste management services are coordinated by the local council, which deals with refuse collection and recycling and operates five civic amenity sites. The electricity Distribution Network Operator supplying Swansea is Western Power Distribution. Welsh Water provides drinking water supply and wastewater services to Swansea. There is a water treatment works at Crymlyn Burrows. Reservoirs which supply Swansea include the Cray reservoir and the Lliw Reservoirs, which are operated by Welsh Water. There was a high rate of car crime during the 1990s. In 2002, the BBC described Swansea as a "black spot for car crime". Car crime is a central theme in the film Twin Town, which was set in and around Swansea and Port Talbot. The M4 motorway, with junctions 44 to 47, bypasses Swansea, replacing the A48 as the main east-west route. Both the M4 the A48 connect with Neath, Port Talbot and Cardiff to the east and Carmarthen to the west. The A483 dual carriageway links the city centre with the motorway at junction 42 to the east and junction 47 to the north west. On departing Swansea to the north, the A483 multiplexes with the A48 before continuing through mid Wales and terminating at Chester. The A4067 connecting Mumbles with the city centre and continuing up the Swansea Valley towards Brecon is also a dual carriageway for much of its route through Swansea. Other notable local roads include the A484, which provides a link from Fforestfach west to Llanelli, and the A4118, the main route westwards from the city centre across Gower to Port Eynon. Swansea railway station is approximately a ten-minute walk from Swansea bus station. Services calling at Swansea operate to Llanelli, Carmarthen, Haverfordwest, Milford Haven, Tenby, Pembroke Dock and Fishguard Harbour (connecting with the Stena Line to Rosslare Europort and Irish Rail to Dublin Connolly) to the west, Shrewsbury to the northeast via the Heart of Wales Line with four trains each way, Monday–Saturday, and Cardiff Central, Newport, Bristol Parkway, Swindon, Reading and London Paddington to the east run by Great Western Railway. There are also suburban stations in Gowerton, Llansamlet and in Pontarddulais which are served by Transport for Wales. Swansea Airport is a minor aerodrome situated in the Gower providing recreational flights only. Further development of the airport is strongly resisted by the local communities and environmental groups. Swansea is served by Cardiff Airport, 44 miles (71 km) east, in the Vale of Glamorgan, which provides scheduled domestic and international flights. It is approximately 40 minutes away by road or 70 minutes by rail. Pembrey Airport, 17 miles (27 km) to the west offers charter flights to a few European destinations. Swansea Marina to the south of the city centre has berths for 410 leisure boats. An addition 200 berths for leisure boats are located near the mouth of the River Tawe. Further leisure boating berths are being constructed at the Prince of Wales Dock in the Swansea Docks complex. The Swansea Docks complex is owned and operated by Associated British Ports and is used to handle a range of cargo ranging from agribulks and coal to timber and steel. Swansea Docks consists of three floating docks and a ferry terminal. Fastnet Line operated a Swansea Cork Ferry roll-on/roll-off service until November 2011, when the service was ended. A proposal for a catamaran-based passenger ferry service from Ilfracombe to Swansea—scheduled to begin in time for Easter in 2010— has yet to launch. It would have had two return trips a day taking around 50 minutes each way and carried cycles. Bus routes within Swansea are operated predominantly by First Cymru, while smaller bus and coach operators such as NAT Group, South Wales Transport, Lewis Coaches, First Call Travel and DANSA also operate some routes in the city, most of which serving Swansea bus station. First operates the Swansea Metro, a road-based FTR bus rapid transit route, introduced between Morriston Hospital and Singleton Hospital in 2009, and a shuttle bus (Service X10) to Cardiff Central bus station calling at Bridgend Designer Outlet. In late 2015 the fleet of Wright StreetCar articulated buses that served the Swansea Metro route were removed from service and replaced with standard non-articulated Wright StreetLite vehicles. National Express Coaches operate eastbound to Heathrow Airport, Gatwick Airport, London, Birmingham, Cardiff and Bristol, and westbound to Llanelli, Carmarthen and Haverfordwest. Megabus operate eastbound to Cardiff, Newport, Bristol, London, Birmingham, Manchester, Leeds and York, and westbound to Pembrey, Carmarthen, Pembroke Dock, Lampeter, Aberaeron and Aberystwyth. Park and Ride services are operated from car parks at Landore and Fabian Way. During busy periods of the year, additional Park and Ride services are operated from the Brynmill recreation ground. Subsidised services to Fforestfach were cut in 2015 due to local authority financial constraints. Swansea Bay: The Maritime Quarter to the Knab Rock near the Mumbles Pier. Clyne Valley Country Park: Blackpill to Gowerton forming part of National Cycle Network, Route 4. Along the east bank of the River Tawe forming the start of National Cycle Network, Route 43, which terminates at Abercraf. Sustrans advise that it will continue northwards to Builth Wells once complete. Adjacent to the Fabian Way: Forming part of National Cycle Network, Route 4 and extending as the Celtic Trail to Chepstow and (eventually) London. City cruiser pedal vehicles are being introduced to the city centre in a joint venture between the council and Swansea Business Improvement District. A number of beaches around Swansea Bay are promoted to visitors. Surfing is possible at Langland Bay, Caswell Bay and Llangennith, with the latter winning accolades from two national newspapers for the quality of its waves. The five-mile promenade from the Marina to Mumbles offers views across Swansea Bay. The seaside village of Mumbles has a Victorian pier, small, independent shops and boutiques, restaurants and cafes. The south coast of Gower is the chief magnet for walkers, with a path stretching from Mumbles Head across the cliff tops, beaches and coastal woodland to Rhossili. On the Waterfront, Swansea Bay has a five-mile (8 km) sweep of coastline which features a beach, promenade, children's lido, leisure pool, marina and maritime quarter featuring the museums the National Waterfront Museum and Swansea Museum, the oldest museum in Wales. Also situated in the maritime quarter is the Dylan Thomas Centre, which celebrates the life and work of the author with its permanent exhibition 'Dylan Thomas – Man and Myth', and Mission Gallery, a unique art gallery also in the heart of the Maritime Quarter which hosts a range of exhibitions from various art disciplines; it also host a craft space, with ranging works from local and international artists. The Dylan Thomas Centre is the focal point for the annual Dylan Thomas Festival (27 October – 9 November). There is a permanent exhibition at the Dylan Thomas Birthplace and Home for 23 years in Uplands which has been restored to its condition as a new house when bought by the Thomas family in 1914 a few months before Dylan was born in the front bedroom. The SA1 Waterfront area is the latest development for living, dining and leisure. Swansea Bay, Mumbles and Gower are home to various parks and gardens and almost 20 nature reserves. Clyne Gardens is home to a collection of plants set in parkland and host to 'Clyne in Bloom' in May. Singleton Park has acres of parkland, a botanical garden, a boating lake with pedal boats, and crazy golf. Plantasia is a tropical hothouse pyramid featuring three climatic zones, housing a variety of unusual plants, including several species which are extinct in the wild, and monkeys, reptiles, fish and a butterfly house. Other parks include Cwmdonkin Park, where Dylan Thomas played as a child, and Victoria Park which is close to the promenade on the seafront. Oxwich Bay on the Gower Peninsula was named the most beautiful beach in Britain by travel writers who visited more than 1,000 beaches around the world in search of the perfect sands (2007). The Travel Magazine praised Oxwich for "magnificent and unspoilt" scenery and as a "great place for adults and children to explore". It has over three miles (5 km) of soft, golden sands, making it the ideal family getaway. The Guardian named it one of Britain's blue-riband top 10 category beaches (2007). The Independent newspaper hailed Rhossili Bay as "the British supermodel of beaches" (2006) and the best beach in Britain for breathtaking cliffs (2007), whilst The Sunday Times listed it as one of the 25 best beaches in the world (2006). Thanks to its clear air and lovely golden sand, this romantic stretch of sand was voted the best place in the UK to watch the sun set (Country Living magazine 2005) and one of the top romantic spots in the country (The Guardian 2007). Llangennith Beach, with its soft sands, consistent beach break and great facilities, was listed as the best place to learn how to surf in Britain by The Observer (2006) and one of the 10 'classic surfing beaches by The Guardian (2007). Gower also claims Britain's Best Beach, Three Cliffs Bay. The Gower landmark topped the BBC Holiday Hit Squad nationwide competition (2006) and was voted Britain's best camping beach by The Independent thanks to its superb setting and quiet location (2007). Three Cliffs Bay also made the final of the ITV series Britain's Favourite View – the only nomination in Wales and backed by singer Katherine Jenkins. Nearby Brandy Cove came sixth in an online poll to find the UK's top beach for the baby boomer generation (2006). Beaches which won 2006 Blue Flag Beach Awards are: Bracelet Bay, Caswell Bay, Langland Bay, Port Eynon Bay and Swansea Marina (one of the few Blue Flag Marinas in Wales). All of these beaches also won a Seaside Award 2006. Limeslade was awarded the Rural Seaside Award and the Green Coast Award. Other Green Coast Awards went to Pwll Du, Rhossili Bay and Tor Bay. Swansea has a range of activities including sailing, water skiing, surfing, and other watersports, walking and cycling. Part of the Celtic Trail and the National Cycle Network, Swansea Bay provides a range of traffic-free cycle routes including along the seafront and through Clyne Valley Country Park. The Cycling Touring Club CTC has a local group in the area. Swansea Bay, Mumbles and Gower have a selection of golf courses. Prior to closure in 2003, Swansea Leisure Centre was one of the top ten visitor attractions in the UK; it has been redeveloped as an indoor waterpark, rebranded the 'LC', and was officially opened by Queen Elizabeth II on 7 March 2008. The Wales National Pool is in Swansea. Swansea has a range of pubs, bars, clubs, restaurants and a casino. Swansea had two casinos until 30 August 2012 when Aspers closed. The majority of city centre bars are situated on Wind Street, with various chains represented including Revolution, Varsity, Yates's and Walkabout. Some venues feature live music. The Mumbles Mile, described by the BBC as "one of Wales's best-known pub crawls" has declined in recent years with a number of local pubs being converted into flats or restaurants. ^ "Swansea – Coat of Arms". www.swansea.gov.uk. Retrieved 11 January 2018. ^ "Largest Cities in the UK". UKCities. Retrieved 13 October 2017. ^ "2011 Census: Release of Initial Results" (PDF). City and County of Swansea Research and Information Unit. Archived from the original (PDF) on 5 September 2012. Retrieved 26 July 2012. ^ Chris Pyke (14 July 2014). "Is this the coolest map of Wales EVER? Etymological map of Welsh place names makes the country look like it is Game of Thrones". walesonline. Retrieved 16 April 2016. ^ David William (October 2010). Life in the United Kingdom: The Land and the People. Intercontinental Books. p. 247. ISBN 978-9987-16-017-4. ^ Chisholm, Hugh, ed. (1911). "Swansea" . Encyclopædia Britannica. 26 (11th ed.). Cambridge University Press. p. 183. ^ "Swansea Timeline". Genuki. 2007. Retrieved 29 July 2007. ^ "Swansea's Three Nights Blitz". BBC. 3 September 2005. Retrieved 24 May 2008. ^ "Tourism joins shopping at market". BBC News. 29 September 2003. Retrieved 27 July 2007. ^ "Physical Description". City and County of Swansea. 21 August 2006. Archived from the original on 8 August 2007. Retrieved 26 July 2007. ^ "History of Swansea in Glamorgan – Map and description". visionofbritain.org.uk. ^ "Borough/County Borough/ City of Swansea records". archivesnetworkwales.info. Archived from the original on 5 June 2011. Retrieved 9 May 2009. ^ "Swansea – Login". Government of the United Kingdom. ^ "Council leader resigns after defeat". BBC News. 15 June 2004. Retrieved 29 July 2007. ^ a b "Student information – Swansea geography" (PDF). City and County of Swansea. 2007. Archived from the original (PDF) on 8 August 2007. Retrieved 26 July 2007. ^ "Swansea – Tourist Information". iknow-uk. Archived from the original on 18 May 2008. Retrieved 23 June 2008. ^ "Wales in Bloom". Wales in Bloom. Archived from the original on 12 May 2008. Retrieved 23 June 2008. ^ "Average Weather for Swansea, SC - Temperature and Precipitation". weather.com. Archived from the original on 26 August 2014. Retrieved 2 February 2019. ^ "2001 Census Socio Economic Profile" (PDF). Archived from the original (PDF) on 27 March 2009. ^ "2004 Mid Year Estimates, Population Estimates Unit, ONS. Crown Copyright". City and County of Swansea. 2007. Archived from the original on 27 September 2007. Retrieved 26 July 2007. ^ "Census 2011 Usual Resident Population". National Statistics Office. 2013. Retrieved 27 July 2013. ^ Population and Migration – Ethnic groups (Swansea) Office for National Statistics. Retrieved 15 June 2009. ^ "2010 Mid Year Estimates of Population" (PDF). Archived from the original (PDF) on 4 November 2012. Retrieved 30 December 2011. ^ "The Living Tradition Festival Listing, 2007". The Living Tradition. 2007. Retrieved 26 July 2007. ^ "Brangwyn Hall & The Empire Panels". BBC. 2006. Retrieved 27 July 2007. ^ Katie Bellis. "Tickets for Swansea's Biggest Weekend sold out in minutes". WalesOnline. Retrieved 27 May 2018. ^ "Results of the 2001 Census of Population on the Language in Electoral Wards". Welsh Language Board. 2007. Archived from the original on 20 February 2006. Retrieved 26 July 2007. ^ "Listed building index". City and County of Swansea. Archived from the original on 9 August 2014. Retrieved 30 April 2016. ^ Thomas, Jeffrey L. (2009). "Swansea Castle". Castles of Wales. Retrieved 30 April 2016. ^ "Libanus (Tabernacle) Chapel, Morriston". Religious Architecture. The National Library of Wales. Retrieved 30 April 2016. ^ "Swansea New Guildhall". British Listed Buildings. Retrieved 30 April 2016. ^ "Listed Buildings in Swansea, Wales". British Listed Buildings. Retrieved 30 April 2016. ^ "Dylan Thomas and the Kardomah set". The Independent. ^ "Swansea Jack – Swansea History Web". ^ "Tourism Swansea Bay". tourismswanseabay.co.uk. Archived from the original on 21 August 2008. ^ "Glamorgan First-Class Matches played on St Helen's, Swansea". Cricket Archive. Archived from the original on 15 May 2007. Retrieved 27 June 2006. ^ "Two pieces of Welsh sporting history auctioned". icWales.co.uk. 2006. Retrieved 27 July 2007. ^ "Cricket archive". Archived from the original on 7 November 2012. ^ a b "2001 Census Key Statistics: Table KS07: Religion". Archived from the original on 4 October 2012. ^ "More about the church – Ebenezer Baptist Church, Swansea". Ebenezer.org.uk. 17 January 2016. Retrieved 25 January 2016. ^ "Welsh Government – Home" (PDF). 20 July 2012. Archived from the original (PDF) on 20 July 2012. ^ "New mosque 'would benefit all'". BBC News. 23 December 2004. ^ "City Centre Strategic Framework". City and County of Swansea. 2007. Archived from the original on 8 August 2007. Retrieved 27 July 2007. ^ "Work Begins on Wales Tallest". Skyscrapernews.com. 26 June 2006. Archived from the original on 21 January 2009. Retrieved 24 May 2008. ^ a b c d e "Swansea Economic Profile October 2008" (PDF). Archived from the original (PDF) on 27 March 2009. ^ "Academic Expertise". WDA. 2007. Archived from the original on 27 September 2007. Retrieved 27 July 2007. ; "Knowledge Transfer from the Civil and Computational Engineering Centre and Future Interaction Technologies". Swansea University. 2007. Archived from the original on 30 September 2007. Retrieved 27 July 2007. ^ "Award winners announced!". The Times Higher Education Supplement. 2005. Archived from the original on 17 August 2007. Retrieved 27 July 2007. ^ "Swansea University Medical School". swansea.ac.uk. ^ "List of Schools 2006/2007" (PDF). City and County of Swansea. 2006. Archived from the original (PDF) on 8 August 2007. Retrieved 27 July 2007. ^ "Newspaper Reports". nsdatabase.co.uk. Archived from the original on 3 March 2016. ^ "South West Wales". BBC News. ^ "Only Two Can Play (1962)". IMDb. 20 March 1962. ^ Robin Turner (22 September 2004). "Ex-Doctor 'may return as villain'". icWales.co.uk. Retrieved 24 May 2008. ^ "City launch for Swansea Monopoly". BBC News. 26 October 2005. ^ "Swansea Love Story". CNN. ^ Kathryn Williams (22 September 2013). "Pirate hero in new Assassin's Creed is a Welshman – Wales Online". walesonline. ^ "Introduction to the Air Ambulances in Wales". Wales Air Ambulance. Archived from the original on 3 April 2008. Retrieved 27 June 2008. ^ "Police 'not soft' on car crime". BBC News. 16 September 2002. Retrieved 26 July 2007. ^ "British Hooligan Scene". view from the terrace. 1997. Archived from the original on 4 July 2007. Retrieved 27 July 2007. ^ "Swansea Airport No Expansion". WildlifeWebSite.com. Archived from the original on 5 January 2013. Retrieved 3 July 2008. ^ "Marina expansion plans get underway". City and County of Swansea. Archived from the original on 25 January 2009. Retrieved 27 June 2008. ^ "Swansea Marina: Development Projects". City and County of Swansea. Archived from the original on 24 January 2009. Retrieved 27 June 2008. ^ "Port of Swansea". Associated British Ports. Retrieved 27 June 2008. ^ "Swansea-Cork ferry: Fastnet Line to close service with loss of 78 jobs". BBC News. ^ "Spring launch for new fast ferry". BBC News. ^ "Swansea Metro service kicks off – City and County of Swansea. Retrieved 27/09/09". Archived from the original on 3 December 2013. ^ "Park and Ride". City and County of Swansea council. 2 April 2008. Retrieved 27 June 2008. ^ "Fforestfach Park And Ride Axed". The Wave. 24 March 2016. ^ "City and County of Swansea – Minutes of the Licensing Committee, Friday 19 September 2008. Retrieved 27/09/09" (PDF). Archived from the original (PDF) on 2011-10-14. ^ "Swansea BID – Projects. Retrieved 27/09/09/". Archived from the original on 17 March 2012. ^ "WAN:: Fabian Way Bridge by Studio Bednarski Ltd in Swansea, United Kingdom". worldarchitecturenews.com. Archived from the original on 17 September 2012. Retrieved 6 December 2018. ^ "Swansea Bay Sports and Activities – Watersports". Swansea Bay Futures. Archived from the original on 7 July 2011. Retrieved 27 August 2010. ^ "Swansea Museum". Archived from the original on 12 December 2013. ^ "Dylan Thomas Centre". Archived from the original on 15 November 2013. ^ "Swansea – Nature Reserves". Archived from the original on 10 May 2013. ^ "Swansea – Parks and green spaces". Government of the United Kingdom. ^ "And the most beautiful beach in Britain is..." The Travel Magazine. 27 February 2007. Retrieved 27 June 2008. ^ McCracken, Matthew (13 July 2007). "10 sandy beaches". The Guardian. London h. Retrieved 27 June 2008. ^ "The 50 Best: UK beaches (26–50)". The Independent. London. 26 June 2006. Retrieved 27 June 2008. ^ a b "Hillend Camping Park". Hillend Camping. Archived from the original on 13 May 2008. Retrieved 27 June 2008. ^ "10 Romantic Settings". The Guardian. London. 14 July 2007. Retrieved 27 June 2008. ^ Taylor, Demi; Nelson, Chris (13 August 2006). "Learning to surf". The Observer. London. Retrieved 27 June 2008. ^ Alderson, Alf (11 October 2007). "Top 10 UK surf spots". The Guardian. London. Retrieved 27 June 2008. ^ Turner, Robin (26 September 2006). "We love... Three Cliffs Bay". WalesOnline. Retrieved 27 June 2008. ^ "The 50 Best: Camping sites". The Independent. London. 26 June 2006. Retrieved 27 June 2008. ^ "Gower Peninsula". ITV. 6 August 2007. Retrieved 27 June 2008. ^ "Welsh beaches a mecca for the over-50s". WalesOnline. 17 August 2006. Retrieved 27 June 2008. ^ "Visit Swansea Bay – Watersports". Archived from the original on 28 October 2008. ^ "Visit Swansea Bay – Walking". Archived from the original on 16 September 2008. ^ "Visit Swansea Bay – Cycling and Mountain Biking". Archived from the original on 22 January 2009. ^ "Swansea Cycling Map" (PDF). Archived from the original (PDF) on 30 October 2008. ^ "CTC- (Cyclist Touring Club) Swansea and West Wales Member Group". ^ "Visit Swansea Bay – Golf". Archived from the original on 28 October 2008. ^ "Swansea Leisure Centre to shut". BBC News. 13 November 2003. Retrieved 26 July 2007. ^ "Swansea's New Leisure Centre". City and County of Swansea. 2007. Archived from the original on 2 November 2007. Retrieved 6 December 2007. ^ "National Pool 'not just for elite'". BBC News. 21 July 2004. Retrieved 27 July 2007. ^ "Grosvenor Casino Swansea | One amazing venue – One great night out". Grosvenorcasinos.com. 11 June 2013. Archived from the original on 24 January 2013. Retrieved 12 July 2013. ^ "Visit Swansea Bay – Nightlife". Archived from the original on 22 January 2009. ^ "Closures shrink famous pub crawl". BBC News. 31 January 2007. ^ "City & County of Swansea Economic Development Division, Tourism Student Information Pack" (PDF). Archived from the original (PDF) on 27 June 2013. ^ Mulcahy, Noreen. "Cork – International Relations". Cork City Council. Archived from the original on 18 May 2013. Retrieved 28 August 2013. ^ "Partner und Freundesstädte". Stadt Mannheim (in German). Retrieved 26 July 2013. ^ "Local Government Association: Twin Town search". Archived from the original on 19 November 2011. ^ "Nantong's twin city: Swansea, Wales of UK". Jiangsu.net. 12 September 2009. Retrieved 12 July 2013. "Swansea" . The New Student's Reference Work . 1914.